It has become somewhat of a joke in the Tidy Stourbridge group that they never litter pick the Lye area of Stourbridge. It is not through want of trying, it’s just that when the scheduled group pick ‘n’ pint night/day comes around, the weather Gods unleash their wrath on the area. Last Wednesday (23rd April) evening stayed true to form and the heavens opened and the Lye Pick ‘n’ Pint was postponed until the following Wednesday (30 April). So forward to 30th April, the group turned up to rid the area of it’s litter issues, reduced in number due to work commitments by some, Dave Colley (Clent View Carriers) & Lee to name but two, although Dave managed to show up for the Pint part of the evening, well done Dave for showing your support. Dave’s work commitment and Trish’s recent departure from Storage King employment left the group with the challenge of storing and delivering the picking equipment. Roger stepped forward as a Knight in shining armour hi-viz vest, to collect and deliver the equipment with his white steed Mondeo. I’m sure that the group would like to thank Roger for his efforts. The issue of storing and delivering the equipment to future events may have been resolved by StuWeb Race Timing who seem keen to store the group’s equipment. Talks are underway at the moment so watch this space for any developments. On the night of the Lye Bypass Pick ‘n’ Pint 13 large bags of general food packaging / sweet wrappers and pop bottles were collected. 2 Large refuge sacks of drink cans. An abandoned shopping trolley, discarded syringes and 1 sack of glass bottles. This amount of rubbish collected in just 90 minutes or so, by a band of local heroes, Dave, Colin, Trish, Andy, Pat, Graham, Roger, Gary, Judith, and Craig. None of this would have been possible without the help of Dudley MBC for the supply of the litter collecting equipment and Bathams Brewery for the supply of Heavy Duty refuge sacks. As usual the cans collected will be crushed and sorted by Alun from Amcanu’n Uchel Limited, then recycled with monies collected going to Living Springs. The next pick ‘n’ Pint will take place on 7:00pm Wednesday 14th May 2014 at Rose & Crown Inn, High Street, Wordsley drinks afterwards will be at the same venue. Everyone is welcome, All equipment is supplied. No commitment to future litter picks is required, if you just wish to collect in an area near to your home, that is fine. We are a welcoming group and any help will be gratefully received. We all deserve to live in a TIDY STOURBRIDGE. 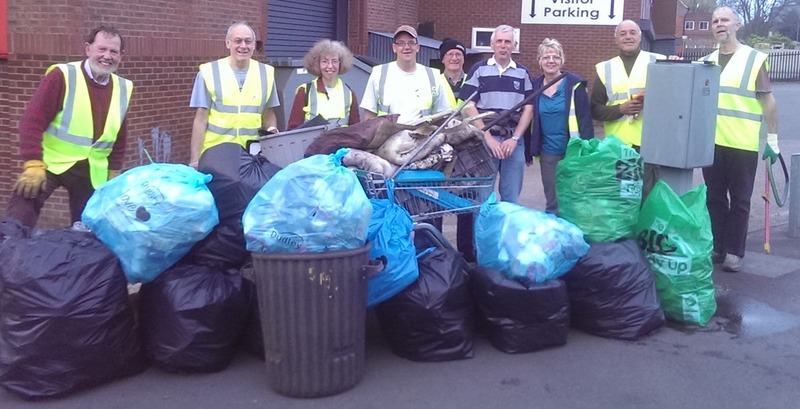 Thank you and until next time, Keep Stourbridge Tidy. It was the first Pick & Pint of the summer season and as with previous years the first litter pick started slightly earlier than normal at 6:30 rather than the usual 7:00pm to take advantage of the available light. 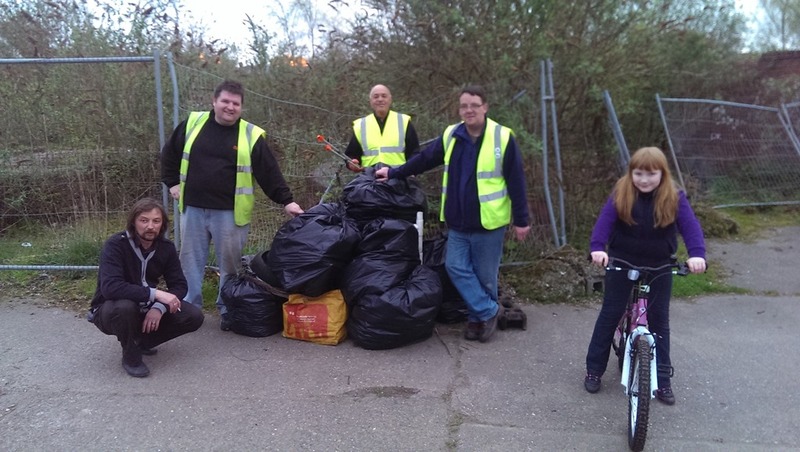 The team of volunteers had previously collected litter from the area by the Bonded Warehouse in the winter season but unfortunately did not have the time to complete the task. So it was decided that a second visit would be required before the undergrowth hid all the litter that had been discarded by a few inconsiderate individuals. Although it was the second visit within a few months the Tidy Stourbridge team of volunteers, Andy, Pat, Graham, Colin, Dave, Sophie and Craig, managed to collect 10 large bags of general litter one large sack of glass bottles and three large sacks of crushed cans that are kindly sorted into steel and Aluminium by Alun Nicholas of Amcanu’n Uchel Ltd. and weighed in, with all proceeds going to Living Spring, Tidy Stourbridge’s chosen charity. Thanks also goes out to Colin for recycling the glass gathered by the team. Whilst we are acknowledging people’s contributions we would like to thank Dave Colley from Clent View Carriers for arranging the collection of the litter gathered by the group and Trish from Storage King Dudley for storing and delivering the litter picking equipment. Everyone is welcome to join us, just look for the group of people with yellow tabards. If previous visits to this area are anything to go on the more people the better. Pick’n’Pint returns tonight (Wednesday) at 7pm to the area around Wordsleys most famous landmark. All volunteers will meet in the car park outside the Glasshouse Cone on Bridge Street and then tackle some of the most litter strewn areas of the village in the areas on the map below. 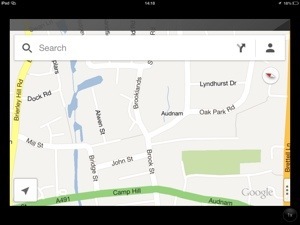 We will be back in the pub by 830pm which will be The Bird in Hand in John Street. All kit supplied, if this is your neighbourhood please come out and show your support.